1. James Joyce was born in the same year as another notable modernist writer, Virginia Woolf. But the similarities don’t end there. Both were born in 1882, but both writers also died in the same year, 1941. Both wrote landmark modernist novels, published in the 1920s, whose principal action takes place over just one day in mid-June (the novels in question are Ulysses and Mrs Dalloway). Both pioneered the stream of consciousness technique associated with modernist writing. 2. James Joyce was scared of thunder and lightning. Joyce’s fear of thunder and lightning – the technical name for which is astraphobia – stems from his childhood, when his fervently Catholic governess told him that thunderstorms were God manifesting his anger. This fear stayed with Joyce into adulthood. It even probably helped to inspire a 100-letter word which Joyce coined in his final novel, Finnegans Wake (1939), Bababadalgharaghtakamminapronnkonnbronntonnepronntuonnthunntrovarrhounawnskawntoohoohoordeenenthurnuk, which appears on the first page and is meant to designate the symbolic thunderclap that accompanied the Fall of Adam and Eve. 3. He gave us the word ‘quark’. This word for a subatomic particle was taken from Finnegans Wake, where three seabirds give the cheer to King Mark: ‘Three quarks for Muster Mark!’ Physicist Murray Gell-Mann liked the word, and so proposed it for the particle in the 1960s. One of the other suggestions, favoured by Richard Feynman among others, was ‘parton’ – though whether Dolly was the inspiration here is unclear. 4. His masterpiece, Ulysses, was published on his fortieth birthday – and wasn’t. In fact, much of the novel had already appeared in print in two magazines, the Little Review and the Egoist, by the time the novel was published by Shakespeare & Company on 2 February 1922. (Joyce very deliberately made the publication of the novel coincide with his own birthday.) And even then, only two copies actually appeared on that day: these were whisked to Paris by morning train to Sylvia Beach, who ran the publishing house. Beach kept one copy, while Joyce took the other copy out with him to mark the occasion. We covered the interesting story behind Joyce’s Ulysses in an interesting post last year. 5. Joyce met fellow novelist Marcel Proust for a disastrous dinner in 1922. This was the year that Joyce’s masterpiece Ulysses was published (and the year Proust died, in November; the meeting took place in May). The two writers spent the meal discussing their ailments, before eventually admitting that they hadn’t read each other’s work. Also present at this historic dinner party – which took place on 18 May 1922 – were Picasso and Stravinsky. 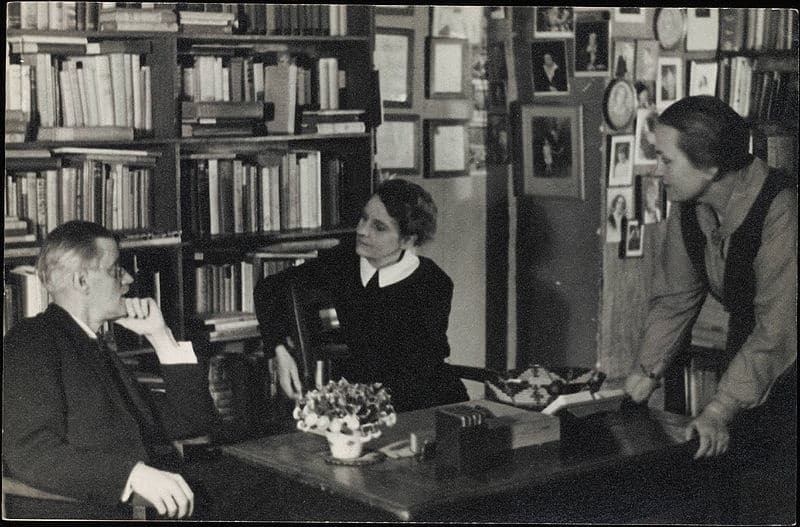 Image: James Joyce with Sylvia Beach and Adrienne Monnier at the offices of Shakespeare & Company, 1938 (photograph by Gisèle Freund), public domain. I read this with great interest. Had never realized the parallels between Joyce and Woolf! So similar, and yet so different. What’s more, they were both absolutely nuts. Like most modernist writers. Very interesting! Thanks for this post. I studied quarks in university but was not told that the name came from Finnegans Wake. Glad to have been the bearer of a new fact! Absolutely nuts? You have no idea. I wish i could make it more than a hundred pages through Ulysses, its simultaneously frustrating, dull and brilliant. Woolf on the other hand is just awesome! I once went to find James Joyce’s house in Zurich when I lived in Switzerland, only to find it had been knocked down and a modern apartment block built in its place. That is a shame! I didn’t know it had gone. How did they let that happen? I should admit right here that I’ve never read any of James Joyce’s work. And yet I find these facts immensely interesting. Read on! I really love these posts. It is so fun to learn little details about these author’s and their lives. My God, what a dinner party that must have been. I loved Ullyses after finally making my way through it. I knew that Virginia Woolf had plenty to say on Ulysses but now I know why. So many links in both their lives! Just reread Araby for my writing class! Wish I could have been at the dinner party in fact 5 with a notebook and pencil. I love Joyce and all his writings but this post was as fascinating as it was hilarious! It gives me great hope, as a writer and son-to-be author that the fact I’m slightly mad is perfectly fine – I’m in good company! Richard Ellemann’s bio Joyce is an interesting read. I made it a point during my first visit to the city to visit Shakespeare &Co because of Joyce connection. Yes. I have Ellmann’s Wilde and that was his last book I think. Ah, the joy of being enlightened! …and there you have the real problem with fantasy dinners. Thanks for this – fantastic! hey thanks for stopping by my blog serial, the zombie detective! Still getting it up and running. And thanks for the article on Joyce – don’t know how I missed this but as I was about to do an article on him its very helpful!